"If you play with fire, you will get burned." That's what my father told me, and it's what I have told all of my children. Except for recently, when my finger was on fire and I told my son "If you watch a trained chemist play with fire, you will get learned." After capturing his attention with the large blue flame that had engulfed my finger, I was planning on explaining the drastic reduction in heat released during combustion of partially oxygenated hydrocarbons, such as ethanol molecules in the flaming Sambuca, as compared to those lacking oxygen, such as wax molecules in candles. But all I got was a pater-patronizing "That's cool Dad", and then "They're getting ready to drop the puck for the second period of the hockey game." I guess the pyrochemistry demonstrations that impressed me as a student just don't cut it after the heavy metal stage shows of Ozzy Osbourne. I was reminded of this "cool flame" demonstration while reading Michael Faraday's classic lectures on "The Chemical History of a Candle." Given in 1860, these turned out to be his final, and most remembered, annual series of Christmas lectures for children. In the mid-1820's, Faraday himself initiated this holiday tradition at London's Royal Institution, where he was the Fullerian Professor of Chemistry. They are still given today, and are a popular televised event in Great Britain. What's so special about a candle? In Faraday's own words: "There is no more open door by which you can enter into the study of natural philosophy than by considering the physical phenomena of a candle." 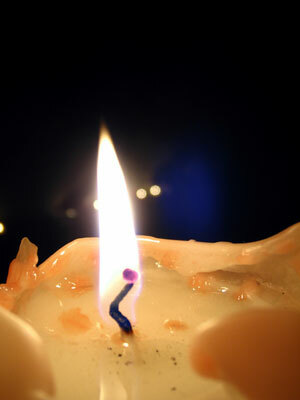 His lectures touched on the chemical reactions involved in making candles, as well as burning them. He also described the capillary action of the wicks, and diagrammed the eddies formed by hot, rising gases. The lectures were peppered with demonstrations, including one related to the old English Christmas tradition of snapdragon. To play snapdragon, you pour warm brandy in a warmed dish (I prefer Sambuca, which is flavored by glycyrrhizic acid extracted from licorice bush roots), sprinkle raisins in the dish, then light with a match. (This should be done on a non-flammable surface, and players should all be of legal drinking age.) Tongues of flame will dance excitedly, and the object of the game is to stick your fingers in, pick up raisins, and pop them in your mouth. First-time players will usually be reluctant to stick their fingers into the flaming dish (which is imagined to be the snapping mouth of a dragon). Chemistry majors, who have learned about the thermochemistry of oxygenated hydrocarbons, are ringers. To further mitigate the limited heat transferred to their fingers, by evaporation of water, they might lick their fingers first (they probably will afterwards as well, but for a different reason). Unlike the flame of burning alcohol, which is relatively cool and blue, the flame of a burning wax candle is very hot and yellowy. Both generate light. Light is often used as a metaphor for truth or knowledge, as in the title of the brilliant New York Times bestseller "The Demon-Haunted World: Science as a Candle in the Dark" (published by Ballantine Books in 1996). Carl Sagan, who was the Royal Institution's Christmas Lecturer in 1977, wrote this book not just to explain what science is, but to remind us what the world was like before science was. It was published the same year that he died as the result of a bone marrow disease. I think it is one of the most important books about science that has ever been written, and I can recommend it to you, even if you have no background in science whatsoever. Sagan saw no shortage of gullible people who, even in the modern world, fear demons of all shapes and sizes. He questioned the financial and media resources that are sucked into black holes such as UFO sightings and psychics of all sorts. There's a real difference between favoring a "lucky tie" that your children gave you, and making important life choices based on your horoscope for the day. Likewise, a creative imagination can be very useful, especially in science, but hallucinations (perhaps brought on by too much Sambuca) can be destructive. While I can get discouraged by chemophobic activists and anti-science presidents, my New Year's resolution is to follow the lead of great candle bearers, such as Michael Faraday and Carl Sagan, with the hope that some who are haunted by demons will learn to delight in snapdragons.